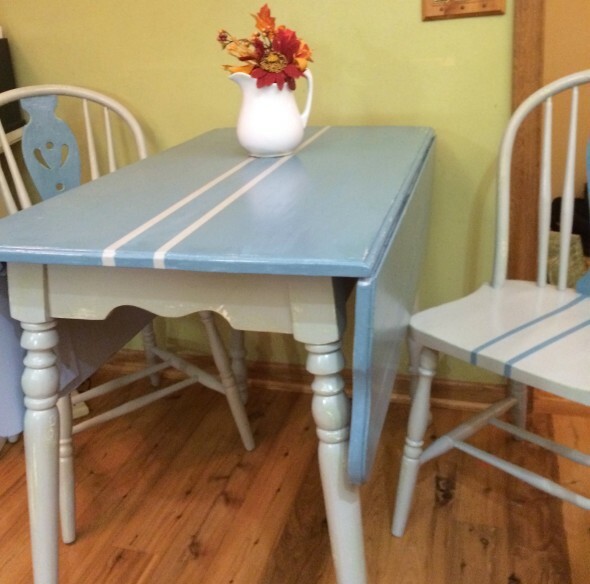 Vintage Table Makeover A vintage table and chairs rescued form a flea market becomes a difficult project to transform but in the end proves to be a great piece to decorate on a budget with. Have you ever had a project that you needed to complete but it hung over your head like homework that you dreaded? Yikes, I so did with a vintage table that I found for a song. I “thought” I couldn’t pass it up. It had great potential, a perfect candidate for a makeover, but what it lacked was it didn’t speak to me. Yup, that’s right. Items speak to me. Somehow I get a feeling or a connection to an item that it wants to come home with me. I have shared this feeling or connection I have with a piece in a previous post I wrote back in 2014 about decorating with thrifty finds. I thought I was the only crazy person that experienced this, but to my delight, Anderson and Grant, very articulately shared the exact same experience. Thank you, Jaimie, for writing about it. It’s very validating to know this is a shared experience. This time around however, instead of being aware of the silence or lack of a gut feeling, a “good deal” overcame the feeling and I took it home. There it sat in my garage until the weather forced me to complete a vintage table makeover. Here’s the story. 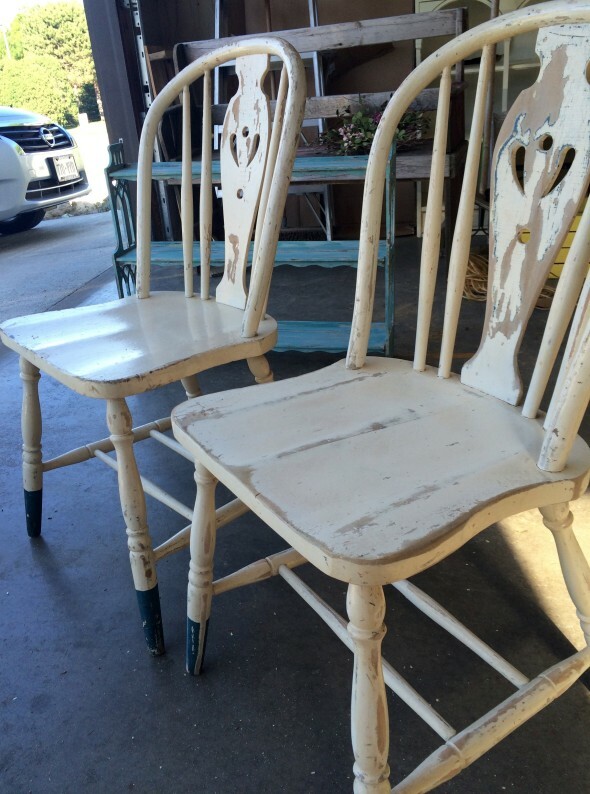 After making the rounds at a local flea market, I came across a cute vintage table and chairs that needed some loving. This piece sparked my interest for two reasons. First, it had great potential. Even though it was an older piece, it was very sturdy and I never tackled a dining set before. Secondly and more importantly, the price was right. Home it came and was put into the garage where it sat. It sat there all summer long. Things started piling up on it. New items would arrive, be transformed , and move on to a new home. Not the vintage table. It still sat unattended waiting for a makeover until the car needed it space back in the garage. I knew if I would just complete the table, adequate space would be freed up. I jumped in with both feet, a positive attitude, and the sense of urgency. I began the project giving the table and chairs good sanding. There were a few layers of different paint in some areas that proved to be a bit of a challenge. That’s ok, I like a challenge but it seemed to take a toll on my enthusiasm. After completing the sanding portion of the project, the table went back to sitting. You see, I didn’t have a connection to it. I couldn’t see the vision. This became really hard homework. Time ticked on and the weather in Wisconsin was becoming cooler. Not the ideal circumstances to paint. Fortunately, we had a stretch of some great fall weather allowing me to get the piece done. Looking back, I have come to realize I choose to transform and decorate with thrifty finds for the mere enjoyment, not because of a “good deal”. 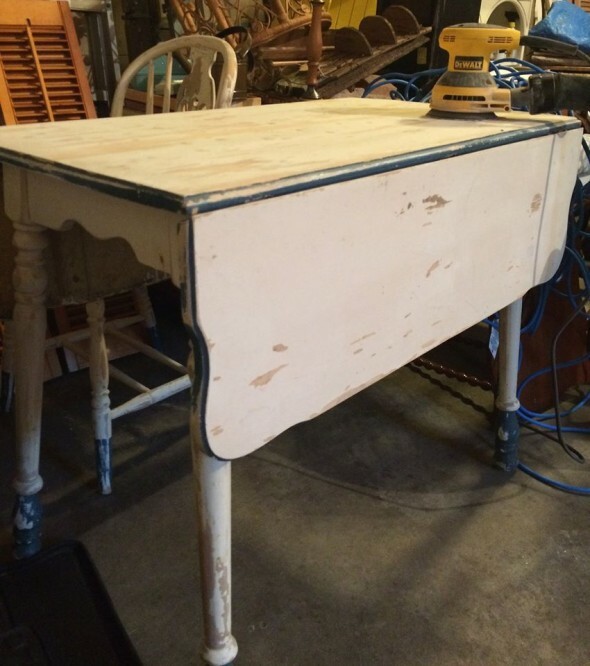 Good news though, someone did find a connection with this vintage table makeover and gave it a good home. For me, I can now park in my garage… just in time. Thanks, Pili, I love stripes too. I absolutely love your transformation on this table & chairs combo. It’s totally my style. Found you on Wake Up Wednesday. I do like the look of your project it is beautiful. Now that you have finished it, it looks awesome. Well done. Kathleen recently posted…5 Blogger Styles – Where do you fit? Thank you for accepting my invitation to join Vintage Charm. I hope to see you back again this Thursday! Oh, it looks so much better! I love the contrasting white and blue on the tables versus the chairs! I totally understand the not being able to park in the garage because it’s filled with furniture feeling. You’re ahead of me if there’s room in yours now. I need to get to work! Thanks for sharing with us at Dream. Create. Inspire. Link. Sweet table, great post. It’s one of my faves this week for Wake Up Wednesday! Thanks for sharing. Your table turned out so nice, I like the color choice and what you did with the chairs, I grew up with this type of table, we would use it for the evening meal, I wish I had the table from my grandmas or aunts table,, love the folding leaves, great space saver. Thanks for sharing on the #OMHGFF this week, hope to see you for #OMHGWW. Oh I so know that feeling of having a project hanging over your head…it’s hard when the inspiration isn’t flowing! This turned out lovely though! I wish it was in my dining room!! I know just what you mean about connecting. And I love what you’ve done to the table and so glad it has a great, new home. As soon as I saw the first photo, I fell in love with it and after you painted it, it’s even more beautiful. You rock! Mary I understand you perfectly about items speaking to you. Yes, I too read Jamie’s post. And the other thing about not being able to finish a project because you are not feeling it, yep. Same problem, Things can drag in my house, Meanwhile other last minute project can fly be. You never know what will happen in a day. Yes, Mary that is so correct thanks for understanding the craziness!! Your make over of the table and chairs is remarkable. I’m a blue and white fan so your couldn’t have picked colors I would have liked any better. I co-host Vintage Charm link party on Thursday’s and would love for you to link up this project. The party starts at 8:00am EST Thursday mornings and runs through 8:00am EST Monday. Hope to see you there! I love the stripes you added! Nice touch! Kristen from The Road to Domestication recently posted…The No Tricks, ALL TREATS Halloween Giveaway! Thanks Kristin, it just needed a little something. I totally have the items speaking to me thing. But I tend to buy a bunch of things I feel called to use and then they sit. Usually until the perfect moment when I realize I need them but it’s usually not in the original way I intended. I had that happen with some beads I bought for a bracelet I wanted to make. Decided I didn’t really care for how they looked as a bracelet and they were a bit bulky to work with but a few months go by and I’m making a boho swimsuit bag and bam! I decided I wanted to bead the fringe of my bag and suddenly I needed them! The bag looks super cute and I used my beads! Definitely your heart needs to be into every project you do that’s for sure! This looks great though! I love the little stripe work with the paint! Thanks Therese for sharing. Yes it happens to me to, I may have a new purpose or vision for a squired item. I love it when it works out better than intended. This is a nice piece. I totally get the “piece of item” speaking to you kind of thing. And yea, having an item sitting there that needs something done it it. I am glad you got this piece finished – looks awesome!